Alison’s class have been using a HOTBIN for around 8 months. Tony Callaghan (HOTBIN Inventor) visited in early spring to see how they were getting on. The class at Collingwood had a bad experience with their first “plastic dalex” compost bin. It developed a wasp’s nest, and unfortunately when they emptied the bin, several pupils and the teacher all got severely stung. When they called in HOTBIN last year, top of the requirements for the HOTBIN was "will we avoid wasps when using the HOTBIN to compost". HOTBIN did a short presentation and talked the pupils through what waste to collect and how to fill the bin. We kept the focus on key tasks like keeping the lid shut. The compost monitors created a check list to make sure valve setting OK and lid had was closed after filling. 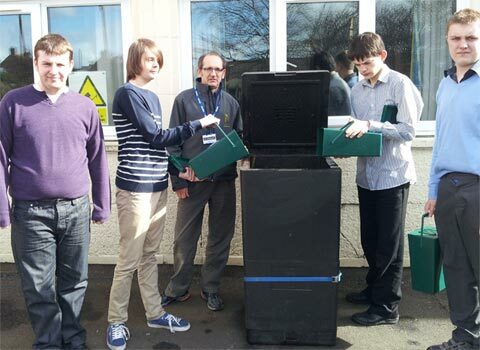 Alison and the School focus on getting the pupils to take ownership of their waste. They want them to learn how to recycle and use compost on the school garden where they grow vegetables. They believe the skills will transfer back to the home. (The school has a large and beautiful garden area – sorry our photo shows the pupils and HOTBIN on location close to the collection point). The school is currently adding sandwich leftovers – banana skins, lettuce, cucumbers, bits of bread. They have already taken out compost to use on the spring beds. They are happy and want to look at a second HOTBIN. Like many others, after a cautious start, they are now finding they can collect more food waste and have the confidence to step things up. The temperature on the visit was 20°C. To fix the low temperature Tony advised they start to add more shredded paper to balance the water. This tip will get them to increase the temperature up to 40-60°C and eliminate any issues with small fruit flies over the coming months.